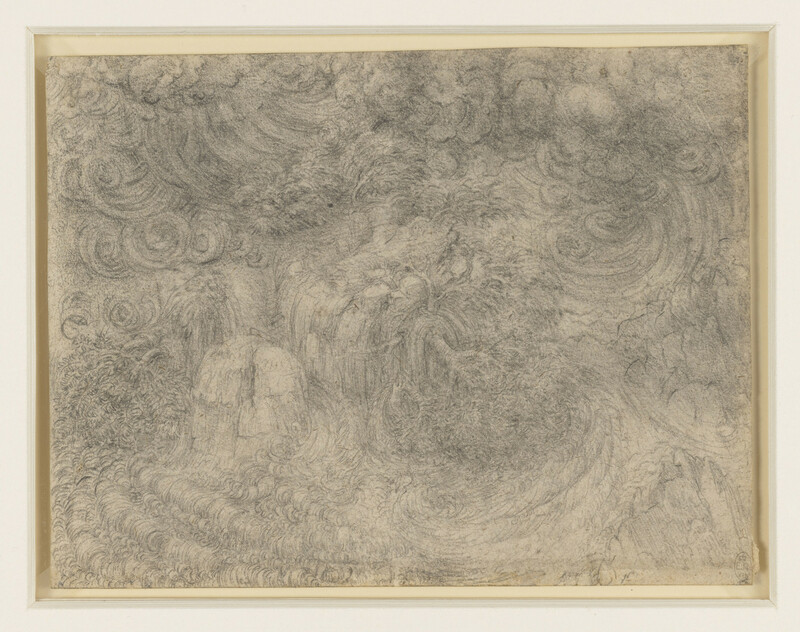 A drawing of a deluge that has broken over a rocky hillock. It bends trees so that they are swept down the hill. The rain flows from the hill in a waterfall, so that the foreground is filled with bubbling, swirling water. A series of eleven drawings by Leonardo of a mighty deluge are among the most enigmatic and visionary works of the Renaissance. Modest in size and densely worked, each shows a landscape overwhelmed by a vast tempest. Here the storm breaks over a hill, ripping apart rocks and trees with great cascades of water. Leonardo was fond of writing accounts of deluges, and the drawings may simply have been made for his own satisfaction rather than as studies for any project.